First, you must have strong, clear ideas. And second, you must present these ideas in a well-organized fashion. However, finding the right words and phrases to connect your ideas can be challenging. If you struggle to come up with the right transitions in your writing, don’t worry: we’ve provided you with a cheat sheet for various popular transitional words and phrases in English! These phrases are useful connectors that will make your writing flow in a natural and organized way. They’re also key phrases to use in the writing sections of English exams like the IELTS or TOEFL. Often times in your writing, you will want to describe effect that resulted from a particular cause. There are several words you can use to talk about this kind of effect. John studied all of the transitional phrases in this article. As a result, his written English improved drastically. Mary was a hard worker; thus, all of her teachers loved her. Another great way to strengthen an argument is to add an example. The phrases for example and for instance are popular ways to introduce an example. Learning English is a great way to connect with a large population. Moreover, it will improve your job prospects. There are plenty of free ways to practice English online. For instance, test your comprehension skills with this listening test. You may present two ideas that are similar or compatible with each other. In this case, there are a few ways you can show this similarity. Exercising every day will keep your body healthy. Similarly, reading and completing puzzles will keep your mind sharp. In addition to the phrases listed above, the words rather and instead are used specifically to explain why you disagree with something. It’s hard to learn different English accents. However, tools like the English accent game make it easier to recognize the many accents and dialects of English. On one hand, studying grammar is important. On the other hand, memorizing rules can be very boring. Some say that learning English is boring, but I disagree. Rather, I think that it can be fun, as long as you do it the right way. Finally, all good essays and arguments must come to an end. Writing conclusions is tough, but it’s much easier when you use one of the words on this list. The following sentences would be a good way to conclude this article. Ultimately, writing in English can be hard, but knowing these transitional words and phrases will make it easier. 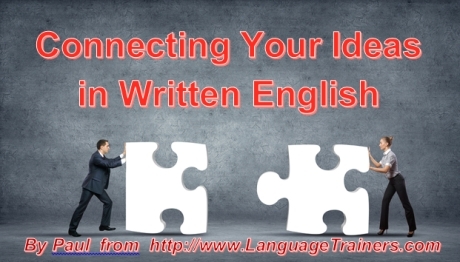 To summarize, connectors are an important part of written English that will make your writing flow better. As you can see, there are plenty of ways to make smooth transitions in your written English. This will be of particular use for those who are writing academic English, or those who are studying for English exams like the IELTS or TOEFL. 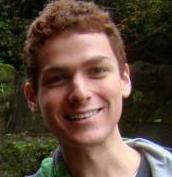 Paul is an English teacher in Buenos Aires, Argentina. He writes on behalf of Language Trainers, a language tutoring service offering personalized course packages to individuals and groups. You can check out their free English level tests and other language-learning resources on their website. Feel free to visit their Facebook page or contact paul@languagetrainers.com with any questions.